NewCastle Gold Ltd. (NewCastle Gold or the "Company") is pleased to announce that a preliminary surface drill testing program has been completed over the JSLA backfilled pit at the Castle Mountain gold project (the "Project") located in San Bernardino County, California. This work is part of an initial assessment of the backfill material placed within the formerly mined JSLA open pit and the viability for its use as feed material in a potential Run-of-Mine heap leach program ("the ROM program"). The ROM program provides an opportunity to reprocess large volumes of sub 0.5 g/t material that was previously treated as waste. Marc Leduc, COO commented: "We are very pleased with the initial findings of the backfill drilling program as it confirms our opinion on the potential of the 'old waste' material as mineralized feed for a ROM heap leach. Armed with this data we intend on examining the merits of operating a modest sized ROM heap leach prior to the full restart of the permitted Castle Mountain Mine. The operational concept of reprocessing the 'old waste' material on a ROM heap leach pad could help benefit the project as we could potentially be back in production earlier. The ROM program provides us with the option of quickly restarting the operation as early as 2018, subject to initial capital financing." 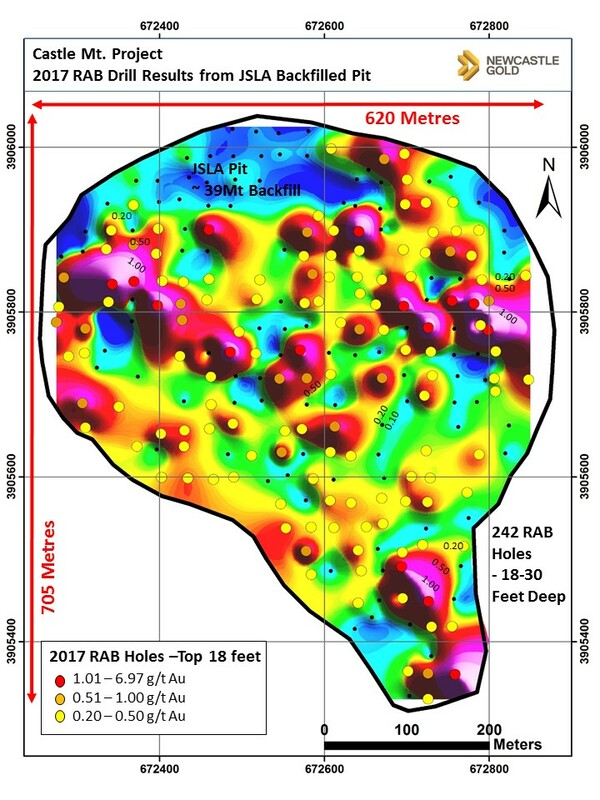 A total of 242 short vertical drill holes were completed in January/February 2017 on approximately 30 metre x 30 metre drill centres across the ~ 29 hectare (72 acre) surface of the pit to depths of up to 10 metres (30 feet). A total of 410 samples were submitted for gold analysis (including 21 QA-QC control samples) and returned an average grade of 0.35 g/t Au. A total of 55% of the assays were above 0.20 g/t Au and the grade increases to 0.54 g/t Au by selecting material above a 0.20 g/t Au cut-off. The JSLA open pit, mined between 1991 to 1996, was subsequently backfilled with blasted ROM 'waste' material from the Jumbo and Oro Belle open pits, located to the north, as the historical cut-off grade for mining was 0.50 g/t Au based on the prevailing gold prices. The current surface drilling program is aimed at identifying where to start the pre-stripping of the starting pit. This program confirms that the top 10 metres (30 feet) contain large areas of mineralized material (see Figure 1). It should be noted that the surface drilling program does not extend down into the full depth of the JSLA backfill. The 'old waste' material could potentially be feed for reprocessing in a ROM heap leach. The JSLA backfill is also being investigated through the current definition program slated to be completed in early April, 2017. The JSLA backfill has already been blasted, and only needs to be transported to the heap leach facility next to the previous heap leach pad and placed using a dump leach method. The Company has performed a review of previous metallurgical test work done on coarse ROM material and estimates the recovery of gold to be in the 50% to 65% range. The company is looking at financing the initial capital for the pre-stripping via straight debt financing, or better alternatives if presented. All new rotary holes were drilled vertically to average depths of 5.5 to 9.1 metres (18 to 30 feet) using an Atlas Copco FlexiROC D65 down-the-hole ("DTH") drill rig supplied by Ledcor CMI Inc. of Reno, Nevada. No true widths for the intercepted intervals have been calculated due to the lack of geological continuity within the unconsolidated backfill material. Rotary drill samples were submitted to ALS Minerals in Reno, Nevada for crushing until 70% of the sample is finer than a nominal two millimeters in size. A 250 gram ("g") sub-sample is taken from the crushed material and pulverized until 85% passes a 200 mesh (75 µm) screen (ALS Method PREP-31). A 30 g portion of pulverized material (pulp) is then sampled and subjected to fire assay ("FA") with atomic absorption ("AA") finish (ALS Method AuAA-23). Any gold assays greater than 10 g/t Au are re-analyzed where a 30 g portion is taken from the pulp and assayed by FA with a gravimetric finish (ALS Method Au 30 g FA -- GRAV). All samples that yield greater than 0.2 ppm assay are also analyzed for gold cyanide solubility (ALS Method AuAA-13).